Although shipping’s environmental credentials often come under attack it is rare for the musings of the IMO’s committees to get a wider airing than in the marine press. So the fact that the results of MEPC 72 were reported on TV and radio stations around the globe underlines that something regarded as of great public interest was being determined. In fact, very little was decided at the meeting beyond a compromise agreement on a strategy that has some ambitions but as yet very little in the way of substantive detailing. What generated all the comment was that shipping has appeared to have adopted a roadmap to reduced dependence on fuels that produce greenhouse gases (GHG) with an aim to eventually phasing them out by the end of this century. The strategy includes a specific reference to “a pathway of CO2 emissions reduction consistent with the Paris Agreement temperature goals”. Before the MEPC meeting an Intersessional Working Group had been exploring the possibilities of reducing shipping’s GHG contribution but it appeared that no compromise was possible between two extreme options. In the event, the protestations of the US and Saudi Arabia meant that the agreement at MEPC was not unanimous. Other countries including Brazil and Argentina had also appeared to be prepared to oppose the measure but did not vote against it. It should not be forgotten that shipping already has an earlier roadmap to GHG reduction, adopted at MEPC 70 in October 2016, which runs until 2023 and under which the IMO has put in train its own gathering of data on GHG emissions. 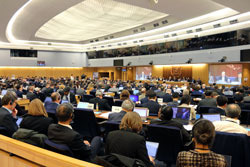 At MEPC 72 this was taken a little further with the declared ambition to reduce the total annual GHG emissions from shipping by at least 50% by 2050 compared to 2008 levels. Part of this will likely be achieved by adding a fourth phase to the EEDI requirements which oblige most newbuildings to be 30% more efficient after 2025 compared to a 2012 baseline. If this idea is adopted, then the most likely result would be a further 10% efficiency saving with effect from 2030. The means by which these efficiency savings are to be achieved is the area most lacking in detail. The IMO and most shipping bodies, although welcoming the ambition, recognise that there will need to be some major technological developments if it is to be realised but have yet to identify what these developments might be and if in fact they are achievable at all. The general perception is that fuels such as LNG will provide the largest contribution. Notably, the EEDI rules do not regulate all GHGs but concentrate only on CO2. As presently formulated, the 30% reduction of CO2 under EEDI rules could almost be achieved by a wholesale switch to LNG which produces about 25% less than HFO, but the additional 10% needed for a fourth phase would need to come from other efficiency savings or a change to fuels with lower CO2 levels still. It is interesting to note that the IMO itself in setting out targets refers to carbon emissions through to 2030 but to GHGs thereafter. Arguably, that could be seen as recognition that LNG reduces carbon but methane itself is a potent GHG. Continuing the momentum of work on this issue, MEPC agreed to hold the fourth Intersessional meeting of the Working Group later in the year. This working group will be tasked with developing a programme of follow-up actions to the initial strategy; further considering how to progress reduction of GHG emissions from ships in order to advise the committee; and reporting to MEPC 73 in October. Shipping’s new GHG strategy may have been the main talking point but other topics were on the agenda at MEPC 72. Another fuel related matter that had received a lot of attention in the weeks preceding the meeting was the view by some sections of the industry that there may be wholesale cheating once the 2020 global cap reduction on sulphur levels is in force. Several shipping bodies had called for a ban on the carriage of non-compliant fuels on any ship not fitted with a scrubber or other approved means onboard. The call was well received and amendments to regulation 14 of MARPOL Annex VI were approved with planned adoption at MEPC 73 in October. If adopted, the amendment would mean carriage of non-compliant fuel for use on board would be prohibited. This should not affect the exemption permitted to vessels if compliant fuel is unavailable but some believe clarification on the amount of fuel that can be taken under such circumstances is needed. Ballast water was also on the agenda, with the finishing touches put to allowing delayed installation of systems on existing ships agreed at MEPC 71. A new Code for approval of systems was adopted. Effectively this makes the 2016 revised G8 type approval guidelines mandatory. Systems approved under the original G8 rules can continue to be installed until 28 October 2020 after which only type-approvals under the new rules will be acceptable.